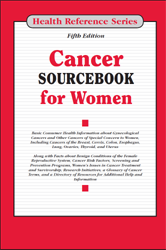 Cancer Sourcebook for Women, 5th Edition offers information about cancers of special concern to women, including breast cancer, gynecologic cancers, and cancers responsible for the most deaths in women, with information included on risk factors, diagnosis, and treatment. Chapter 8—Does Cancer Run in Your Family? Section 13.4—What Are the Radiation Risks from Computed Tomography (CT)? Chapter 65—How to Find a Cancer Treatment Trial?